Today was a good crafting day. I spent the whole day at Simply Knitting, the yarn store that is going out of business. I hadn’t planned it. I stopped at another LYS to look for some Addi Turbo circular needles. It was closed, so I went to Karen’s shop to see if she was still open. Luckily she was and she had two pairs of 24″ #1 Pryms, and one pair of #2’s. I also bought two more skeins of sock yarn. There were several other women there and the conversation was so nice I decided to stay and have lunch. After that I thought I would start a proper swatch to have some knitting to do. I didn’t have my pattern with me, so I cast on the recommended number of stitches for a 4″ swatch according to yarn wrapper. 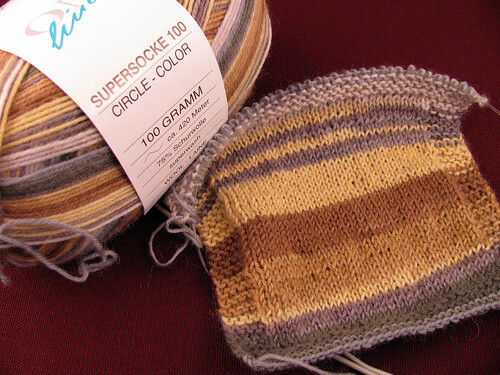 Cookie A.’s sock patterns call for a US 1.5 or 2.5mm. Of course that means to choose between a #1 or a #2, since #1.5’s are not readily available. I think my gauge is fine on the #1 and will use the #2 to cast on and bind off. I am a little bigger than Cookie A’s gauge and a little tighter than suggested on the yarn label. I really don’t want Karen’s shop to go out of business. It is such a pleasant place and I had a really nice day. The Pryms are nice too, and much less expensive than the Turbos. My stitches are a little uneven, but that was due to talking too much, not the quality of the needles. This entry was posted on Friday, April 10th, 2009 at 3:00 am and is filed under Knitting. Tagged: Knitting. You can feed this entry. You can leave a response, or trackback from your own site. Which pattern of Cookie’s are you going to use?